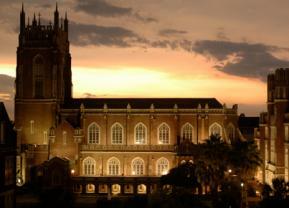 Loyola University New Orleans and First NBC Bank have formed a philanthropic partnership that is bringing fantastic updates to our University Sports Complex in the coming years. Thanks to a generous $1.5 million gift from First NBC, our game court is receiving a significant renovation, including a new floor, new bleachers, new lighting, and other upgrades. For its multiyear gift commitment, First NBC Bank has received naming rights for the court through 2031. It will now be called First NBC Court. 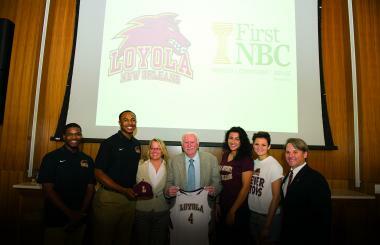 "Student-athletes at Loyola University New Orleans work tirelessly, and we are proud to recognize their successes and contribution to our community," First NBC Bank President and CEO Ashton J. Ryan Jr. says. "Our entire banking team applauds the efforts these young people put forth in the classroom and on the courts." Loyola Vice President of Institutional Advancement Chris Wiseman ’88 (philosophy and political science), Ph.D., adds: "Mr. Ryan and the First NBC team have a great vision of higher education and how the discipline and rigors of athletics contribute to campus life and to our students’ education. We are grateful to First NBC, our Faith in the Future Campaign Co-Chair Derby Gisclair ’73, and Loyola staff member Renny Simno '98 for their work together to make this generous gift a reality. Our students, coaches, and indeed the entire campus community will benefit for years to come. It is a new day for the Wolf Pack!" Loyola’s men’s and women’s basketball, volleyball, and competitive cheer and dance teams both practice and compete in the facility, and student, faculty, staff, and New Orleans residents use the space for intramurals and other recreational activities. "We are honored to establish this partnership and look forward to a long and strong relationship with First NBC Bank, as well as many joyous and exciting games here at the beautifully transformed First NBC Court at Loyola," Vice President of Student Affairs Dr. M.L. "Cissy" Petty says. The renovation of the University Sports Complex began this past June with the addition of new lighting and aesthetic improvements throughout the facility. Installation of permanent bleachers and a reconfigured game floor will take place next summer. "This gift allows us to transform the University Sports Complex into a facility that greatly benefits the entire Loyola community and enriches student life,"Loyola Director of Athletics Brett Simpson '96 (communication), M.B.A. ’03, says. "It will enable us to improve our game day experience for our fans; better serve our growing athletic program; and improve the recreational needs of our faculty, staff, students, and alumni who utilize the facility. It is an exciting time to be a part of Wolf Pack athletics."